In 1978, Joel's album 52nd Street was his first album to peak at #1 on the Billboard 200 chart. Joel released his seventh studio album, Glass Houses, in an attempt to further establish himself as a rock and roll artist; this release featured "It's Still Rock & Roll to Me", Joel's first single to top the Billboard Hot 100 chart, as well as "Don't Ask Me Why" and "Sometimes a Fantasy". His next album, The Nylon Curtain, was released in 1982, and stemmed from a desire from Joel to create more lyrically and melodically ambitious music. An Innocent Man, released in 1983, served as an homage to genres of music which Joel had grown up with in the 1950s, such as rhythm and blues and doo-wop; this release featured "Uptown Girl" and "The Longest Time", two of his most popular songs. After releasing the albums The Bridge and Storm Front in 1986 and 1989 respectively, Joel released his twelfth and final solo album, River of Dreams, in 1993. He went on to release Fantasies and Delusions, a 2001 album featuring classical compositions composed by Joel and performed by British-Korean pianist Richard Hyung-ki Joo. Joel also provided voiceover work in 1988 for the 27th animated Disney film, Oliver & Company, in which he provided the voice of the character Dodger, and contributed to the soundtracks to several different films, including Easy Money, Ruthless People, and Honeymoon in Vegas. Across the 20 years of his solo career, Joel produced 33 Top 40 hits in the US, all of which he wrote himself, and three of which ("It's Still Rock and Roll to Me", "Tell Her About It", and "We Didn't Start the Fire") managed to top the charts. He is also a six-time Grammy Award winner who has been nominated for 23 Grammy Awards. With over 150 million records sold worldwide, he is one of the best-selling artists of all time as well as the sixth best-selling recording artist and the third best-selling solo artist in the United States. His 1985 compilation album, Greatest Hits Vol. 1 & 2, is one of the best-selling albums in the US. Joel was inducted into the Songwriters Hall of Fame (1992), the Rock and Roll Hall of Fame (1999), and the Long Island Music Hall of Fame (2006). In 2001, Joel received the Johnny Mercer Award from the Songwriters Hall of Fame. In 2013, Joel received the Kennedy Center Honors, the nation's highest honor for influencing American culture through the arts. Since the advent of his solo career, Joel has held a successful touring career, holding live performances across the globe in which he sings several of his written songs. In 1987, he became one of the very first artists to hold a rock and roll tour in the Soviet Union following the country's alleviation of the ban on rock and roll music. Despite largely retiring from writing and releasing pop music following the release of River of Dreams, he continues to tour. He frequently performs at Madison Square Garden in Manhattan. Joel has been in several relationships, including marriages to Elizabeth Weber Small, model Christie Brinkley, and Katie Lee. Since 2015, he has been married to Alexis Roderick, his 4th spouse. William Martin Joel was born in the Bronx on May 9, 1949. When he was one year old, his family moved to the Long Island suburb of Hicksville, New York, in the Town of Oyster Bay, where he and his younger sister were raised in a section of Levitt homes. Joel's father, Howard (born Helmut) Joel, a classical pianist and businessman, was born in Nuremberg, Germany, to a Jewish family, the son of a merchant and manufacturer, Karl Amson Joel. Helmut was also educated in Switzerland. His father had created a highly successful mail order textile business, Joel Macht Fabrik. To escape the Nazi regime, Helmut's family emigrated to Switzerland. His father was forced to sell his business at a fraction of its value in order to emigrate. The family reached the United States via Cuba, because immigration quotas for German Jews prevented direct immigration at the time. In the United States, Helmut/Howard Joel became an engineer but always loved music. Joel's mother, Rosalind, was born in Brooklyn to Jewish parents, Philip and Rebecca Nyman, who had immigrated from England. Joel has said that neither of his parents had talked much about World War II, which were such dark years; it was not until later that he learned more about his father's family. After Rosalind and Howard Joel divorced in 1957, he returned to Europe, as he had never liked the United States, considering the people uneducated and materialistic. He settled in Vienna, Austria. He later remarried. Billy Joel has a half-brother, Alexander Joel, born to his father in Europe, who became a classical conductor there. Alexander Joel was the chief musical director of the Staatstheater Braunschweig from 2001 to 2014. Joel reluctantly began piano lessons at an early age, at his mother's insistence. His teachers included the noted American pianist Morton Estrin and musician Timothy Ford. Joel says that he is a better organist than pianist. As a teenager, Joel took up boxing so he could defend himself. He boxed successfully on the amateur Golden Gloves circuit for a short time, winning 22 bouts, but abandoned the sport shortly after his nose was broken in his 24th boxing match. Joel attended Hicksville High School until 1967, but he did not graduate with his class. He had been playing at a piano bar to help his mother make ends meet, which interfered with his attendance; specifically, he missed a crucial English exam, after playing a late-night gig at a piano bar the evening before. Although Joel was a comparatively strong student, at the end of his senior year he did not have enough credits to graduate. Rather than attend summer school to earn his diploma, Joel decided to begin a career in music: "I told them, 'To hell with it. If I'm not going to Columbia University, I'm going to Columbia Records, and you don't need a high school diploma over there'." Joel did eventually sign with Columbia. In 1992, he submitted essays to the school board and was awarded his diploma at Hicksville High's annual graduation ceremony, 25 years after leaving. Influenced by early-rock-and-roll and rhythm-and-blues artists, including groups such as The Beatles, The Drifters and The Four Seasons, Joel favored tightly structured pop melodies and down-to-earth songwriting. That one performance changed my life ... Up to that moment I'd never considered playing rock as a career. And when I saw four guys who didn't look like they'd come out of the Hollywood star mill, who played their own songs and instruments, and especially because you could see this look in John Lennon's face – and he looked like he was always saying: 'F--- you!' – I said: 'I know these guys, I can relate to these guys, I am these guys.' This is what I'm going to do – play in a rock band'. Joel joined the Echoes, a group that specialized in British Invasion covers. The Echoes began recording in 1965. Joel (then 16) also played piano on several records released through Kama Sutra Productions and on recordings produced by Shadow Morton. Joel played on a demo version of "Leader of the Pack", which would become a major hit for the Shangri-Las. Joel states that in 1964 he played on a recording of the Shangri-Las' "Remember (Walking in the Sand)" but he is unaware of whether he played on the demo or master version. The released single included a co-producer credit for Artie Ripp, who later was the first to sign and produce Joel as a solo artist after Michael Lang, who had given Joel a monetary advance, passed Joel along to Ripp to focus his attentions elsewhere. In late 1965, the Echoes changed their name to the Emeralds, and then to the Lost Souls. Joel left the band in 1967 to join the Hassles, a Long Island group that had signed with United Artists Records. Over the next year and a half they released four singles and two albums (The Hassles and Hour of the Wolf). All were commercial failures. Joel and drummer Jon Small left the Hassles in 1969 to form the duo Attila, releasing an eponymous debut album in July 1970. The duo disbanded the following October when Joel began an affair with Small's wife, Elizabeth. The pair later married. Joel signed a contract with the record company Family Productions (owned by Artie Ripp but backed by Gulf + Western), with which he recorded his first solo album, Cold Spring Harbor (a reference to Cold Spring Harbor, a town on Long Island). Ripp states that he spent US$450,000 developing Joel; nevertheless, the album was mastered at too high a speed and as a result, the album was a technical and commercial disappointment. The popular songs "She's Got a Way" and "Everybody Loves You Now" were originally released on this album, but went largely unnoticed until being released as live performances on Songs in the Attic (1981). Columbia released a remastered version of Cold Spring Harbor in 1983. Joel began his Cold Spring Harbor tour in the fall of 1971, touring with his band (Rhys Clark on drums, Al Hertzberg on guitar, and Larry Russell on bass guitar) throughout the U.S. and Puerto Rico, opening for groups such as the J. Geils Band, The Beach Boys, Badfinger, and Taj Mahal. Joel's performance at the Puerto Rican Mar y Sol Pop Festival was especially well-received; and although recorded, Joel refused to have it published on the Mar Y Sol compilation album Mar Y Sol: The First International Puerto Rico Pop Festival. Nevertheless, interest in his music grew. During the spring of 1972, the Philadelphia radio station WMMR-FM began playing a concert recording of "Captain Jack", which became an underground hit on the East Coast. Herb Gordon, a Columbia Records executive, heard Joel's music and introduced him to the company. Joel signed a recording contract with Columbia in 1972 and moved to Los Angeles, California; he lived there for the next three years. For six months he worked at The Executive Room piano bar on Wilshire Boulevard as "Bill Martin". During that time, he composed his signature hit "Piano Man" about the bar's patrons. Despite Joel's new contract, he was still legally bound to Family Productions. Artie Ripp sold Joel's first contract to Columbia. Walter Yetnikoff, the president of CBS/Columbia Records at the time, bought back the rights to Joel's songs in the late 1970s, giving the rights to Joel as a birthday gift. Yetnikoff notes in the documentary film The Last Play at Shea that he had to threaten Ripp to close the deal. Joel's first album with Columbia was Piano Man, released in 1973. Despite modest sales, Piano Man's title track became his signature song, ending nearly every concert. That year Joel's touring band changed. Guitarist Al Hertzberg was replaced by Don Evans, and bassist Larry Russell by Patrick McDonald, himself replaced in late 1974 by Doug Stegmeyer, who would stay with Joel until 1989. Rhys Clark returned as drummer and Tom Whitehorse as banjoist and pedal steel player; Johnny Almond joined as saxophonist and keyboardist. The band toured the US and Canada extensively, appearing on popular music shows. Joel's songwriting began attracting more attention; in 1974 Helen Reddy recorded "You're My Home" (Piano Man). In 1974, Joel recorded his second Columbia album in Los Angeles, Streetlife Serenade. His manager at the time was Jon Troy, an old friend from the New York neighborhood of Bedford-Stuyvesant; Troy would soon be replaced by Joel's wife Elizabeth. Streetlife Serenade contains references to suburbia and the inner city. It is perhaps best known for "The Entertainer", a No. 34 hit in the US. Upset that "Piano Man" had been significantly cut for radio play, Joel wrote "The Entertainer" as a sarcastic response: "If you're gonna have a hit, you gotta make it fit, so they cut it down to 3:05." Although Streetlife Serenade is often considered one of Joel's weaker albums (Joel dislikes it himself), it contains the notable songs "Los Angelenos" and "Root Beer Rag", an instrumental that was a staple of his live set in the 1970s. In late 1975, Joel played piano and organ on several tracks on Bo Diddley's The 20th Anniversary of Rock 'n' Roll all-star album. Disenchanted with Los Angeles, Joel returned to New York City in 1975 and recorded Turnstiles, the first album he recorded with the group of hand-picked musicians who became the Billy Joel Band. Produced by James William Guercio (then Chicago's producer), Turnstiles was first recorded at Caribou Ranch with members of Elton John's band. Dissatisfied with the result, Joel re-recorded the songs and produced the album himself. "Say Goodbye to Hollywood" was a minor hit; Ronnie Spector recorded a cover as did Nigel Olsson, then drummer with Elton John. In a 2008 radio interview, Joel said that he no longer performs the song because singing it in its high original key "shreds" his vocal cords; however, he did finally play it live for the first time since 1982 when he sang it at the Hollywood Bowl in May 2014. Although never released as a single, "New York State of Mind" became one of Joel's best-known songs; Barbra Streisand recorded a cover and Tony Bennett performed it as a duet with Joel on Playing with My Friends: Bennett Sings the Blues. Other notable songs from the album include "Summer, Highland Falls", "Miami 2017 (Seen the Lights Go Out on Broadway)", "Say Goodbye to Hollywood", (a live version of which became a Top 40 hit), and "Prelude/Angry Young Man", a concert mainstay. Columbia Records introduced Joel to Phil Ramone, who would produce all of Joel's studio albums from The Stranger (1977) to The Bridge (1986). The Stranger was an enormous commercial success, yielding four Top-25 hits on the Billboard charts: "Just the Way You Are" (#3), "Movin' Out" (#17), "Only the Good Die Young" (#24), and "She's Always a Woman" (#17). Joel's first Top Ten album, The Stranger was certified multi-platinum and reached number two on the charts, outselling Simon & Garfunkel's Bridge over Troubled Water, Columbia's previous best-selling album. The Stranger also featured "Scenes from an Italian Restaurant", an album-oriented rock classic, which has become one of his best-known songs. The Stranger song "Just the Way You Are" — written for Joel's first wife, Elizabeth Weber — was inspired by a dream and won Grammy awards for Record of the Year and Song of the Year. On tour in Paris, Joel learned the news late at night in his hotel room. Rolling Stone ranked The Stranger the 70th greatest album of all time. He released 52nd Street in 1978, naming it after Manhattan's 52nd Street, which, at the time of its release, served as the world headquarters of CBS/Columbia. The album sold over seven million copies, propelled to number one on the charts by the following hits: "My Life" (#3); followed successes from the album were "Big Shot" (#14), and "Honesty" (#24). A cover of "My Life" (sung by Gary Bennett) became the theme song for a new television sitcom, Bosom Buddies, which featured actor Tom Hanks in one of his earliest roles. 52nd Street won Grammy awards for Best Pop Vocal Performance, Male and Album of the Year. In 1979, Joel also traveled to Havana, Cuba, to participate in the historic Havana Jam festival that took place between March 2–4, alongside Rita Coolidge, Kris Kristofferson, Stephen Stills, the CBS Jazz All-Stars, the Trio of Doom, Fania All-Stars, Billy Swan, Bonnie Bramlett, Mike Finnegan, Weather Report, and an array of Cuban artists such as Irakere, Pacho Alonso, Tata Güines and Orquesta Aragón. His performance is captured in Ernesto Juan Castellanos's documentary Havana Jam '79. The success of his piano-driven ballads like "Just the Way You Are", "She's Always a Woman", and "Honesty" led some critics to label Joel a "balladeer" and "soft rocker". Joel thought these labels were unfair and insulting, and with Glass Houses, he tried to record an album that proved that he could rock harder than his critics gave him credit for, occasionally imitating and referring to the style of new wave rock music that was starting to become popular at the time. On the front cover of the album, Joel is pictured in a leather jacket, about to throw a rock at a glass house (referring to the adage that "people who live in glass houses shouldn't throw stones"). Glass Houses spent six weeks at No. 1 on the Billboard chart and yielded such hits as "You May Be Right" (used as the theme song, covered by Southside Johnny, for the CBS mid-1990s sitcom Dave's World) (#7, May 1980), "Don't Ask Me Why" (#19, September 1980), "Sometimes a Fantasy" (#36, November 1980) and "It's Still Rock and Roll to Me", which became Joel's first Billboard number-one single (for two weeks) in July 1980. "It's Still Rock and Roll to Me" spent 11 weeks in the top 10 of the Billboard Hot 100 and was the 7th biggest hit of 1980 according to American Top 40. His five sold-out shows at Madison Square Garden in 1980 earned him the Garden's Gold Ticket Award for selling more than 100,000 tickets at the venue. Glass Houses won the Grammy for Best Rock Vocal Performance, Male. It would also win the American Music Award for Favorite Album, Pop/Rock category. The album's closing song, "Through The Long Night" (B-side of the "It's Still Rock & Roll to Me" single), was a lullaby that featured Joel harmonizing with himself in a song he says was inspired by The Beatles' "Yes It Is". In a recorded Masterclass at the University of Pennsylvania, Joel later recollected that he had written to the Beatles asking them how to get started in the music industry. In response, he received a pamphlet about Beatles merchandise. This later led to the idea of Joel conducting Q&A sessions around the world answering questions that people had about the music industry. His next release, Songs in the Attic, was composed of live performances of less well-known songs from the beginning of his career. It was recorded during larger US arenas and intimate night club shows in June and July 1980. This release introduced many fans, who discovered Joel when The Stranger became a smash in 1977, to many of his earlier compositions. The album reached No. 8 on the Billboard chart and produced two hit singles: "Say Goodbye to Hollywood" (#17), and "She's Got a Way" (#23). It sold over 3 million copies. Although not as successful as some of his previous albums, the album was still considered a success by Joel. The next wave of Joel's career commenced with the recording of his next studio album, The Nylon Curtain. With The Nylon Curtain, Joel became more ambitious with his songwriting, trying his hand at writing topical songs like "Allentown" and "Goodnight Saigon". Joel has stated that he wanted the album to communicate his feelings about the American Dream and how changes in American politics during the Reagan years meant that "all of a sudden you weren't going to be able to inherit [the kind of life] your old man had." He also tried to be more ambitious in his use of the recording studio. Joel said that he wanted to "create a sonic masterpiece" on The Nylon Curtain. So he spent more time in the studio, crafting the sound of the album, than he had on any previous album. Production of The Nylon Curtain began in the fall of 1981. However, production was temporarily delayed when Joel was involved in a serious motorcycle accident on Long Island on April 15, 1982, severely injuring his hands. Still, Joel quickly recovered from his injuries, and the album only ended up being delayed by a few months. In 1982, he embarked on a brief tour in support of the album. From one of the final shows of the tour, Joel made his first video special, Live from Long Island, which was recorded at the Nassau Veterans Memorial Coliseum in Uniondale, New York on December 30, 1982. It was originally broadcast on HBO in 1983 before it became available on VHS. The Nylon Curtain went to No. 7 on the charts, partially due to heavy airplay on MTV for the videos to the singles "Allentown" and "Pressure". "Allentown" spent six weeks at a peak position of No. 17 on the Billboard Hot 100, making it one of the most-played radio songs of 1982, pushing it into 1983's year-end Top 70, and making it the most successful song from The Nylon Curtain album, besting "Pressure" which peaked at No. 20 (where it resided for three weeks) and "Goodnight Saigon" which reached No. 56 on U.S. charts. Joel's next album moved away from the serious themes of The Nylon Curtain and struck a much lighter tone. The album An Innocent Man was Joel's tribute to R&B and doo wop music of the 1950s and 1960s and resulted in Joel's second Billboard number-one hit, "Tell Her About It", which was the first single off the album in the summer of 1983. The album itself reached No. 4 on the charts and No. 2 in UK. It also boasted six top-30 singles, the most of any album in Joel's catalog. The album was well received by critics, with Stephen Thomas Erlewine, senior editor for AllMusic, describing Joel as being "in top form as a craftsman throughout the record, effortlessly spinning out infectious, memorable melodies in a variety of styles." At the time that the album was released, WCBS-FM began playing "Uptown Girl" both in regular rotation and on the Doo Wop Live. The song became a worldwide hit upon its release. The music video of the song, originally written about then girlfriend Elle MacPherson, featured future wife Christie Brinkley as a high society girl, whose car pulls into the gas station where Joel's character is working. At the end of the video, Joel's "grease monkey" character drives off with his "uptown girl" on the back of a motorcycle. When Brinkley went to visit Joel after being asked to star in the video, the first thing Joel said to her upon opening his door was "I don't dance". Brinkley had to walk him through the basic steps he does in the video. Their work together on this video shoot sparked a relationship between the two which would later lead to their marriage in 1985. In December, the title song, "An Innocent Man", was released as a single and it peaked at No. 10 in the U.S. and No. 8 in the UK, early in 1984. That March, "The Longest Time" was released as a single, peaking at No. 14 on the Hot 100 and No. 1 on the Adult Contemporary chart. That summer, "Leave a Tender Moment Alone" was released and it hit No. 27 while "Keeping the Faith" peaked at No. 18 in January 1985. In the video for "Keeping the Faith", Christie Brinkley also plays the "redhead girl in a Chevrolet". An Innocent Man was also nominated for the Album of the Year Grammy, but lost to Michael Jackson's Thriller. Joel participated in the USA for Africa "We Are the World" project in 1985. Following the success of An Innocent Man, Joel was asked about releasing an album of his most successful singles. This was not the first time this topic had come up, but Joel had initially considered "Greatest Hits" albums as marking the end of one's career. This time he agreed, and Greatest Hits Vol. 1 and 2 was released as a four-sided album and two-CD set, with the songs in the order in which they were released. The new songs "You're Only Human (Second Wind)" and "The Night Is Still Young" were recorded and released as singles to support the album; both reached the top 40, peaking at No. 9 and No. 34, respectively. Greatest Hits was highly successful and it has since been certified double diamond by the RIAA, with over 11.5 million copies (23 million units) sold. It is one of the best-selling albums in American music history, according to the RIAA. Coinciding with the Greatest Hits album release, Joel released a two-volume Video Album that was a compilation of the promotional videos he had recorded from 1977 to the present time. Along with videos for the new singles off the Greatest Hits album, Joel also recorded a video for his first hit, "Piano Man", for this project. Joel's next album, The Bridge (1986), did not achieve the level of success of his previous albums, but it yielded the hits "A Matter of Trust" and "Modern Woman" from the film Ruthless People, a dark comedy from the directors of Airplane! (both #10). In a departure from his "piano man" persona, Joel is shown in the video playing a Gibson Les Paul. The ballad "This is the Time" also charted, peaking at No. 18. On November 18, 1986, an extended version of the song "Big Man on Mulberry Street" was used on a Season 3 episode of Moonlighting. The episode itself was also titled "Big Man on Mulberry Street". The Bridge was Joel's last album to carry the Family Productions logo, after which he severed his ties with Artie Ripp. Joel has also stated in many interviews, most recently in a 2008 interview in Performing Songwriter magazine, that he does not think The Bridge is a good album. In October 1986, Joel and his team started planning a trip to the Soviet Union. He became one of the first American rock acts to play there since the Berlin Wall went up. There were live performances at indoor arenas in Moscow, Leningrad and Tbilisi. Joel, his family (including young daughter Alexa), and his full touring band made the trip in August 1987. The entourage was filmed for television and video to offset the cost of the trip, and the concerts were simulcast on radio around the world. Joel's Russian tour was the first live rock radio broadcast in Soviet history. Most of that audience took a long while to warm up to Joel's energetic show, something that had never happened in other countries he had performed in. According to Joel, each time the fans were hit with the bright lights, anybody who seemed to be enjoying themselves froze. In addition, people who were "overreacting" were removed by security. During this concert Joel, enraged by the bright lights, flipped his electric piano and snapped a microphone stand while continuing to sing. He later apologized for the incident. The album КОНЦЕРТ (Russian for "Concert") was released in October 1987. Singer Pete Hewlett was brought in to hit the high notes on his most vocally challenging songs, like "An Innocent Man". Joel also did versions of The Beatles' classic "Back in the U.S.S.R." and Bob Dylan's "The Times They Are a-Changin". It has been estimated that Joel lost more than US$1 million of his own money on the trip and concerts, but he has said the goodwill he was shown there was well worth it. The Disney animated children's film, Oliver & Company, released in November 1988, features Joel in a rare acting (voice only) role, as the character Dodger. The character's design is based on Joel's image at the time, including his trademark Wayfarer sunglasses. Joel also sang his character's song "Why Should I Worry?". The recording of the album Storm Front, which commenced in 1988, coincided with major changes in Joel's career and inaugurated a period of serious upheaval in his business affairs. In August 1989, just before the album was released, Joel dismissed his manager (and former brother-in-law) Frank Weber after an audit revealed major discrepancies in Weber's accounting. Joel subsequently sued Weber for US$90 million, claiming fraud and breach of fiduciary duty and in January 1990 he was awarded US$2 million in a partial judgment against Weber; in April, the court dismissed a US$30 million countersuit filed by Weber. The first single for the album, "We Didn't Start the Fire", was released in September 1989 and it became Joel's third and – to date – most-recent US number-one hit, spending two weeks at the top. Storm Front was released in October, and it eventually became Joel's first number-one album since Glass Houses, nine years earlier. Storm Front was Joel's first album since Turnstiles to be recorded without Phil Ramone as producer. For this album, he wanted a new sound, and worked with Mick Jones of Foreigner fame. Joel is also credited as one of the keyboard players on Jones' 1988 self-titled solo album, and is featured in the official video for Jones' single "Just Wanna Hold"; Joel can be seen playing the piano while his then-wife Christie Brinkley joins him and kisses him. Joel also revamped his backing band, dismissing everyone but drummer Liberty DeVitto, guitarist David Brown, and saxophone player Mark Rivera, and bringing in new faces, including multi-instrumentalist Crystal Taliefero. Storm Front's second single, "I Go to Extremes" reached No. 6 in early 1990. The album was also notable for its song "Leningrad", written after Joel met a clown in the Soviet city of that name during his tour in 1987, and "The Downeaster Alexa", written to underscore the plight of fishermen on Long Island who are barely able to make ends meet. Another well-known single from the album is the ballad "And So It Goes" (#37 in late 1990). The song was originally written in 1983, around the time Joel was writing songs for An Innocent Man; but "And So It Goes" did not fit that album's retro theme, so it was held back until Storm Front. Joel said in a 1996 Masterclass session in Pittsburgh that Storm Front was a turbulent album and that "And So It Goes", as the last song on the album, portrayed the calm and tranquility that often follows a violent thunderstorm. In the summer of 1992, Joel filed another US$90 million lawsuit against his former lawyer Allen Grubman, alleging a wide range of offenses including fraud, breach of fiduciary responsibility, malpractice and breach of contract but the case was eventually settled out of court for an undisclosed sum. In 1992, Joel inducted the R&B duo Sam & Dave into the Rock & Roll Hall of Fame. That year, Joel also started work on River of Dreams, finishing the album in early 1993. Its cover art was a colorful painting by Christie Brinkley that was a series of scenes from each of the songs on the album. The eponymous first single was the last top 10 hit Joel has penned to date, reaching No. 3 on Billboard's Hot 100 chart and ranking at No. 21 on the 1993 year-end Hot 100 chart. In addition to the title track, the album includes the hits "All About Soul" (with Color Me Badd on backing vocals) and "Lullabye (Goodnight, My Angel)", written for his daughter, Alexa. A radio remix version of "All About Soul" can be found on The Essential Billy Joel (2001), and a demo version appears on My Lives (2005). The song "The Great Wall of China" was written about his ex-manager Frank Weber and was a regular in the setlist for Joel's 2006 tour. "2000 Years" was prominent in the millennium concert at Madison Square Garden, December 31, 1999, and "Famous Last Words" closed the book on Joel's pop songwriting for more than a decade. Beginning in 1994, Joel toured extensively with Elton John on a series of "Face to Face" tours, making them the longest running and most successful concert tandem in pop music history. During these shows, the two played their own songs, covered each other's songs, and performed duets. They grossed over US$46 million in just 24 dates in their sold out 2003 tour. Joel and John resumed the Face to Face tour in March 2009 and it ended again, at least for the time being, in March 2010 in Albany, New York, at the Times Union Center. In February 2010, Joel denied rumors in the trade press that he canceled a summer 2010 leg of the tour, claiming there were never any dates booked and that he intended to take the year off. Joel told Rolling Stone magazine: "We'll probably pick it up again. It's always fun playing with him." Joel and second wife Christie Brinkley announced on April 13, 1994, that they had separated, and their divorce was finalized in August 1994. The two remained friends. 1997's "To Make You Feel My Love" and "Hey Girl" both charted from Joel's Greatest Hits Volume III album. Joel wrote and recorded the song "Shameless" that was later covered by Garth Brooks and reached No. 1 on Billboard's country charts. Joel performed with Brooks during his Central Park concert in 1997. To add onto his achievements Joel was inducted into the Rock 'n Roll Hall of Fame in 1999. Ray Charles made the induction speech and mentioned the duet Joel wrote for the two of them, "Baby Grand" (a track on Joel's album The Bridge released in 1986). On December 31, 1999, Joel performed at New York's Madison Square Garden. At the time, Joel said that it would be his last tour and possibly his last concert. Two of his performances from that night, "We Didn't Start the Fire" and "Scenes from an Italian Restaurant" were filmed and featured that night as part of ABC's special New Year's Y2K coverage. The concert (dubbed The Night of the 2000 Years) ran for close to four hours and was later released as 2000 Years: The Millennium Concert. In 2001, Joel released Fantasies & Delusions, a collection of classical piano pieces. All were composed by Joel and performed by Hyung-ki Joo. Joel often uses bits of these songs as interludes in live performances, and some of them are part of the score for the hit show Movin' Out. The album topped the classical charts at No. 1. Joel performed "New York State of Mind" live on September 21, 2001, as part of the America: A Tribute to Heroes benefit concert, and on October 20, 2001, along with "Miami 2017 (Seen the Lights Go Out on Broadway)", at the Concert for New York City in Madison Square Garden. That night, he also performed "Your Song" with Elton John. In 2003, Joel inducted The Righteous Brothers into the Rock and Roll Hall of Fame, noting that his song "Until the Night" from the album 52nd Street was a tribute to the duo. In 2005, Columbia released a box set, My Lives, which is largely a compilation of demos, b-sides, live/alternative versions and even a few Top 40 hits. The compilation also includes the Umixit software, in which people can remix "Zanzibar" and a live version of "I Go to Extremes" with their PC. Also, a DVD of a show from the River of Dreams tour is included. On January 7, 2006, Joel began a tour across the U.S. Having not written, or at least released, any new songs in 13 years, he featured a sampling of songs from throughout his career, including major hits as well as obscure tunes like "Zanzibar" and "All for Leyna". His tour included an unprecedented 12 sold-out concerts over several months at Madison Square Garden in New York City. The singer's stint of 12 shows at Madison Square Garden broke a previous record set by New Jersey native Bruce Springsteen, who played 10 sold-out shows at the same arena. The record earned Joel the first retired number (12) in the arena owned by a non-athlete. This honor has also been given to Joel at the Wells Fargo Center (Philadelphia) (formerly the Wachovia Center) in Philadelphia where a banner in the colors of the Philadelphia Flyers is hung honoring Joel's 46 Philadelphia sold-out shows. He also had a banner raised in his honor for being the highest grossing act in the history of the Times Union Center (formerly the Knickerbocker Arena and Pepsi Arena) in Albany, New York. This honor was given to him as part of the April 17, 2007, show he did there. On June 13, 2006, Columbia released 12 Gardens Live, a double album containing 32 live recordings from a collection of the 12 different shows at Madison Square Garden during Joel's 2006 tour. Joel visited the United Kingdom and Ireland for the first time in many years as part of the European leg of his 2006 tour. On July 31, 2006, he performed a free concert in Rome, with the Colosseum as the backdrop. Joel toured South Africa, Australia, Japan, and Hawaii in late 2006, and subsequently toured the Southeastern U.S. in February and March 2007 before hitting the Midwest in the spring of 2007. On January 3 of that year, news was leaked to the New York Post that Billy had recorded a new song with lyrics—this being the first new song with lyrics he'd written in almost 14 years. The song, titled "All My Life", was Joel's newest single (with second track "You're My Home", live from Madison Square Garden 2006 tour) and was released into stores on February 27, 2007. On February 4, Joel sang the national anthem for Super Bowl XLI, becoming the first to sing the national anthem twice at a Super Bowl. and on April 17, 2007, Joel was honored in Albany, New York, for his ninth concert at the Times Union Center. He is now holding the highest box office attendance of any artist to play at the arena. A banner was raised in his honor marking this achievement. On December 1, 2007, Joel premiered his new song "Christmas in Fallujah". The song was performed by Cass Dillon, a new Long Island based musician, as Joel felt it should be sung by someone in a soldier's age range (though he himself has played the song occasionally in concert.) The track was dedicated to servicemen based in Iraq. Joel wrote it in September 2007 after reading numerous letters sent to him from American soldiers in Iraq. "Christmas in Fallujah" is only the second pop/rock song released by Joel since 1993's River of Dreams. Proceeds from the song benefited the Homes For Our Troops foundation. On January 26, 2008, Joel performed with the Philadelphia Orchestra celebrating the 151st anniversary of the Academy of Music. Joel premiered his new classical piece titled, "Waltz No. 2 (Steinway Hall)" arranged by Brad Ellis. He also played many of his less well-known pieces, with full orchestral backing arranged by Mr. Ellis, including the rarely performed Nylon Curtain songs "Scandinavian Skies" and "Where's the Orchestra?". On March 10, 2008, Joel inducted his friend John Mellencamp into the Rock and Roll Hall of Fame in a ceremony at the Waldorf Astoria Hotel in New York City. Joel's staying power as a touring act continues to the present day. He sold out 10 concerts at the Mohegan Sun Casino in Uncasville, Connecticut from May to July 2008. The casino honored him with a banner displaying his name and the number 10 to hang in the arena. On June 19, 2008, he played a concert at the grand re-opening of Caesars Windsor (formerly Casino Windsor) in Windsor, Ontario, Canada to an invite-only crowd for Casino VIPs. His mood was light, and joke-filled, even introducing himself as "Billy Joel's dad" and stating "you guys overpaid to see a fat bald guy". He also admitted that Canadian folk-pop musician Gordon Lightfoot was the musical inspiration for "She's Always A Woman". On July 16, 2008, and July 18, 2008, Joel played the final concerts at Shea Stadium before its demolition. His guests included Tony Bennett, Don Henley, John Mayer, John Mellencamp, Steven Tyler, Roger Daltrey, Garth Brooks, and Paul McCartney. The concerts were featured in the 2010 documentary film Last Play at Shea. The film was released on DVD on February 8, 2011. The CD and DVD of the show, Live at Shea Stadium were released on March 8, 2011. On December 11, 2008, Joel recorded his own rendition of "Christmas in Fallujah" during a concert at Acer Arena in Sydney and released it as a live single in Australia only. It is the only official release of Joel performing "Christmas in Fallujah", as Cass Dillon sang on the 2007 studio recording and the handful of times the song was played live in 2007. Joel sang the song throughout his December 2008 tour of Australia. On May 19, 2009, Joel's former drummer, Liberty DeVitto, filed a lawsuit in NYC claiming Joel and Sony Music owed DeVitto over 10 years of royalty payments. DeVitto had never been given songwriting or arranging credit on any of Joel's songs, but he claimed that he helped arrange some of them, including "Only the Good Die Young". In April 2010, it was announced that Joel and DeVitto amicably resolved the lawsuit. 2011 marked the 40th anniversary of the release of Joel's first album, Cold Spring Harbor. According to Joel's official website, to commemorate this anniversary, Columbia/Legacy Recordings originally planned "to celebrate the occasion with a definitive reissue project of newly restored and expanded Legacy editions of the complete Billy Joel catalog, newly curated collections of rarities from the vaults, previously unavailable studio tracks and live performances, home video releases and more", although this never fully came to fruition. The album Piano Man was re-released in a two-disc Legacy edition in November 2011. In 2012, Joel signed an exclusive worldwide publishing agreement with Universal Music Publishing Group (UMPG), and its subsidiary Rondor Music International. Under the agreement, UMPG and Rondor replaced EMI Music Publishing in handling Joel's catalog outside the U.S. Additionally, the agreement marked the first time since Joel regained control of his publishing rights in the 1980s that he began to use an administrator to handle his catalog within the U.S. The agreement's focus is on increasing the use of Joel's music in movies, television programs, and commercials. On December 12, 2012, Joel performed as part of 12-12-12: The Concert for Sandy Relief at Madison Square Garden, a concert held for all the victims of Hurricane Sandy. He changed the lyrics to "Miami 2017 (Seen the Lights Go Out on Broadway)" to make it relate to all the damage caused by Sandy. In May 2013, it was announced that Joel would hold his first ever indoor Irish concert at the O2 in Dublin on November 1. He subsequently announced his return to the UK for the first time in seven years to perform three dates in October and November. Joel played two arena dates in Manchester and Birmingham plus a very special show at London's Hammersmith Apollo. In October, Joel held a surprise concert on Long Island at The Paramount (Huntington, New York) to benefit Long Island Cares. The venue holds a capacity of 1,555 and sold out in five minutes. Joel headlined a solo arena concert in New York City for the first time since 2006 when he performed at Barclays Center in Brooklyn on December 31, 2013. In 2015, Joel performed 21 concerts (in addition to his Madison Square Garden residency) from January 7 to August 2 in various cities around the U.S. and Canada. On December 3, 2013, it was announced that Joel would become a franchise of Madison Square Garden, playing one concert a month indefinitely, starting with a date on January 27, 2014. On January 7, 2014, the Billy Joel in Concert tour began. The tour started in the Amway Center (in Orlando, Florida) and he performed several cover songs such as Elton John's "Your Song", Billy Preston's "You Are So Beautiful" (in tribute to Joe Cocker), The Beatles' "With a Little Help from My Friends", "Can't Buy Me Love", and "When I'm 64", Robert Burns' "Auld Lang Syne", and AC/DC's "You Shook Me All Night Long" (with Brian Johnson). Rufus Wainwright joined Joel during the concert to sing "New York State of Mind". Joel also performed an unusual set, including the song "Souvenir" (from 1974's Streetlife Serenade) and excluding "We Didn't Start the Fire". On August 4, 2015 Joel played the final concert at Nassau Coliseum before the arena underwent a US$261 million renovation. On April 5, 2017, Joel played the first concert at the newly renovated Nassau Coliseum. On June 24, 2017, he returned to Hicksville High School fifty years after his would-be graduating class received their diplomas, to deliver the honorary commencement address. It was also the 25th anniversary of receiving his own diploma from the same High School. In 2019, Joel announced a concert at Camden Yards, home of the Baltimore Orioles, marking the first-ever concert at the baseball stadium. In 1996, Joel merged his long-held love of boating with his desire for a second career. With Long Island boating businessman Peter Needham, he formed the Long Island Boat Company. In November 2010, Joel opened a shop in Oyster Bay, Long Island, to manufacture custom-made, retro-styled motorcycles and accessories. In 2011, Joel announced that he was releasing an autobiography that he had written with Fred Schruers, titled The Book of Joel: A Memoir. The book was originally going to be released in June 2011, but in March 2011 Joel decided against publishing the book and officially cancelled his deal with HarperCollins. Rolling Stone noted, "HarperCollins acquired the book project for US$3 million in 2008. [However,] Joel is expected to return his advance on that sum to the publisher." According to Billboard, "the HarperCollins book was billed as an 'emotional ride' that would detail the music legend's failed marriage to Christie Brinkley, as well as his battles with substance abuse." In explaining his decision to cancel the book's release, Joel said, "It took working on writing a book to make me realize that I'm not all that interested in talking about the past, and that the best expression of my life and its ups and downs has been and remains my music." In 2014, Schruers published a biography, simply titled Billy Joel, based on his extensive personal interviews with Joel. Joel's first wife was Elizabeth Weber Small. When their relationship began, she was married to Jon Small, his music partner in the short-lived duo Attila, with whom she had a son. When the infidelity was exposed, Weber (temporarily) severed her relationships with both men. Weber and Joel later married in 1973 and she became his manager. His one-time producer Artie Ripp said Joel's songs "She's Got a Way" and "She's Always a Woman" were inspired by her, as was the waitress character in "Piano Man". They divorced on July 20, 1982. Joel married a second time, to model Christie Brinkley, in March 1985. Their daughter, Alexa Ray Joel, was born December 29, 1985. Alexa was given the middle name of Ray after Ray Charles, one of Joel's musical idols. Joel and Brinkley divorced on August 26, 1994. On October 2, 2004, Joel married Katie Lee, his third wife. At the time of the wedding, Lee was 23 and Joel was 55. Joel's daughter, Alexa Ray, then 18, served as maid-of-honor. Joel's second wife, Christie Brinkley, attended the union and gave the couple her blessing. Lee works as a restaurant correspondent for the PBS show, George Hirsch: Living it Up!. In 2006, Katie Lee hosted Bravo's Top Chef. She did not return for a second season, instead going on tour with her husband. She began writing a weekly column in Hamptons magazine, and became a field correspondent for the entertainment television show Extra. On June 17, 2009, they announced their separation. On July 4, 2015, Joel married a fourth time, to Alexis Roderick, an equestrian and former Morgan Stanley executive, at his estate on Long Island. Governor of New York Andrew Cuomo conducted the ceremony. The couple had been together since 2009. On August 12, 2015, the couple's daughter, Della Rose Joel, was born. The couple had a second daughter, Remy Anne, on October 22, 2017. Joel has battled major depressive disorder for many years. In 1970, a career downturn and personal problems (noted above, in his affair with his drummer's wife) aggravated his condition. He left a suicide note and attempted to end his life by drinking furniture polish. Later he said, "I drank furniture polish. It looked tastier than bleach." His drummer and bandmate, Jon Small, rushed him to the hospital. Joel checked into Meadowbrook Hospital, where he was put on suicide watch and received treatment for depression. In 1971 Joel released his debut album, Cold Spring Harbor, including the track "Tomorrow Is Today", related to this incident. Joel later recorded "You're Only Human (Second Wind)" as a message to help prevent teen suicide. In 2002, Joel entered Silver Hill Hospital, a substance abuse and psychiatric center in New Canaan, Connecticut. In March 2005, he checked into the Betty Ford Center, where he spent 30 days for the treatment of alcohol abuse. Although Joel has donated money to Democratic candidates running for office, he has never publicly affiliated himself with the Democratic Party. Although he is not known for publicly endorsing political candidates, he did play a benefit with Bruce Springsteen to raise money for Barack Obama's presidential campaign in 2008. He has performed at benefit concerts that have helped raise funds for political causes. However, in regards to celebrities endorsing political candidates, Joel has said, "People who pay for your tickets, I don't think they want to hear who you're going to vote for and how you think they should vote." Nonetheless, in 2016, after his sarcastic dedication of "The Entertainer" to then-Republican candidate Donald Trump was taken as a serious endorsement, Joel told the New York Daily News in an email that he would be voting for Hillary Clinton. Joel's parents were both born into Jewish families, but he was not raised Jewish. He attended a Roman Catholic church with friends. At age 11, he was baptised in a Church of Christ in Hicksville. He now identifies as an atheist. Joel bought a house in Centre Island, New York in 2002 for US$22 million. He also owns a house in Sag Harbor. Joel's waterfront residence near Boca Raton, Florida went on the market in November 2015. As of June 2016, the 3.76-acre (1.52 ha) property was priced at US$27 million. In 1986, Joel was on the site selection committee for the Rock and Roll Hall of Fame board. Seven members of the committee voted for the Hall to be located in San Francisco, and seven voted for Cleveland, Ohio; this tie was broken when Joel voted for Cleveland. Joel was inducted into the Rock and Roll Hall of Fame in Cleveland in 1999 by one of his chief musical influences, Ray Charles. Joel was also named MusiCares Person of the Year for 2002, an award given each year at the same time as the Grammy Awards. At the dinner honoring him, various artists performed versions of his songs, including Nelly Furtado, Stevie Wonder, Jon Bon Jovi, Diana Krall, Rob Thomas and Natalie Cole. Joel has won five Grammys, including Album of the Year for 52nd Street and Song of the Year and Record of the Year for "Just the Way You Are". In 1993, Joel was the second entertainer out of thirty persons to be inducted into the Madison Square Garden Walk of Fame. On September 20, 2004, Joel received a star on the Hollywood Walk of Fame, for his work in the music industry, located at 6233 Hollywood Boulevard. He was inducted into the Long Island Music Hall of Fame on October 15, 2006. Joel is the only performing artist to have played both Yankee and Shea Stadiums, as well as Giants Stadium, Madison Square Garden, and Nassau Veterans Memorial Coliseum. Joel has banners in the rafters of the Times Union Center, Nassau Coliseum, Madison Square Garden, Mohegan Sun Arena in Uncasville, Connecticut, Wells Fargo Center in Philadelphia, Hartford Civic Center in Hartford, and the Carrier Dome in Syracuse. He has also sponsored the Billy Joel Visiting Composer Series at Syracuse University. On December 12, 2011 Joel became the first non-classical musician honored with a portrait in Steinway Hall. On December 29, 2013 in Washington, D.C., Joel received Kennedy Center Honors, the nation's highest honor for influencing American culture through the arts. On July 22, 2014, the Library of Congress announced that Joel would be the sixth recipient of the Gershwin Prize for Popular Song. He received the prize at a performance ceremony in November 2014 from James H. Billington, the Librarian of Congress, and Supreme Court Justice Sonia Sotomayor. ^ a b Erlewine, Stephen Thomas (2006). "Billy Joel Biography. AllMusic. Retrieved on December 7, 2008. ^ "Thirty-Three-Hit Wonder". newyorker.com. Retrieved July 19, 2018. ^ Gamboa, Glenn (September 12, 2013). "Billy Joel named Kennedy Center honoree". Newsday. Retrieved October 15, 2013. ^ Top Selling Artists. RIAA. Retrieved on June 8, 2012. ^ "Top Selling Albums". RIAA. Retrieved September 11, 2012. ^ "Billy Joel". Rock & Roll Hall of Fame. Retrieved January 19, 2017. ^ "Billy Joel: Johnny Mercer Award". Songwriters Hall of Fame. Retrieved July 21, 2017. ^ Mark Bego (2007). Billy Joel: The Biography. p. 13. ^ "Past students of Morton Estrin" Archived October 13, 2007, at the Wayback Machine. mortonestrin.com; retrieved December 7, 2008. ^ "Billy Joel: The Piano Man In A New York State Of Mind". KCBS-TV. December 17, 2013. ^ "Billy Joel". classicbands.com. 2007. Retrieved October 6, 2008. ^ "Billy Joel Interview." The Charlie Rose Show. PBS, 1993. ^ Brozan, Nadine (June 26, 1992). "Chronicle". The New York Times. Retrieved August 19, 2011. ^ Tamarkin, Jeff. "Joel, Billy." Oxford Music Online [Oxford UP]. Oxford University Press, n.d. Web. October 5, 2015. ^ Crandall, Bill. "10 musicians who saw the Beatles standing there". CBS News, February 6, 2014. ^ a b "Billy Joel Biography". Sing365.com. Retrieved November 2, 2010. ^ Joel with Howard Stern on Sirius Radio Bluebird Reviews! November 24, 2010. Retrieved March 2, 2014. ^ "Billy Joel: 1994 Recipient of The Century Award". Billboard: 13. December 3, 1994. Retrieved October 28, 2015. ^ "Leiber – Stoller – Goldner Present The Shangri-Las [advertisement]". Billboard: 5. August 15, 1964. Retrieved October 28, 2015. ^ Schruers, Fred (2014). Billy Joel: The Definitive Biography. New York: Crown Publishing. ISBN 978-0-8041-4019-5. Retrieved January 14, 2016. ^ Joel, Billy. . Oxford Music Online, June 15, 2015. ^ Proefrock, Stacia. "Attila". AllMusic. Retrieved November 2, 2010. ^ a b Goodman, Fred (March 1991). "An Innocent Man". Spy: 73. Retrieved October 22, 2015. ^ "Cold Spring Harbor – Billy Joel: Awards". AllMusic. Retrieved July 8, 2013. ^ a b c d e Bordowitz, Hank (2006). Billy Joel: The Life and Times of an Angry Young Man. Billboard Books. p. 39. ISBN 978-0-8230-8248-3. ^ Tallmer, Jerry (July 16–23, 2003). "Billy Joel grapples with the past". The Villager. New York City. Archived from the original on July 21, 2010. Retrieved January 9, 2011. ^ "Major 7th chords – a talk with Billy Joel". The Actors Studio, USA. 1999. ^ The Last Play at Shea (documentary film). 2010. Interview with Yetnikoff. ^ The Last Play at Shea (2010). October 28, 2010. The New York Times. ^ Chesher Cat. "Everybody I Shot is Dead". everybodyishotisdead.blogspot.com. Retrieved August 19, 2011. ^ "The Return of 'The Stranger' – 30th Anniversary Legacy Edition of Billy Joel's Top-Selling..." Reuters. July 31, 2008. Archived from the original on July 26, 2012. Retrieved March 17, 2009. ^ Schruers, Fred (2015). Billy Joel: The Definitive Biography. Three Rivers Press. p. 130. ^ Webb, Craig (2016). The Dreams Behind the Music: Learn Creative Dreaming As 100+ Top Artists Reveal Their Breakthrough Inspirations. p. 76. ^ Billy Joel Grammy Awards at The Recording Academy. ^ "500 Greatest Albums of All Time: Billy Joel, 'The Stranger'". Rolling Stone. Archived from the original on July 18, 2012. Retrieved September 16, 2012. ^ "article on Havana Jam". People. March 19, 1979. Retrieved September 11, 2012. ^ Kozak, Roman (August 9, 1980). "Singer Alters Summer Tour: Double LP Set For November?". Billboard. Vol. 92 no. 32. USA: Billboard Publications. p. 35. Retrieved March 30, 2019 – via Google books. ^ Melhuish, Martin (September 10, 1980). "The Pringle Column". The Interior News. Smithers, British Columbia, Canada. Sun. p. b7. Retrieved March 30, 2019 – via Newspapers.com. ^ a b Billy Joel on The Nylon Curtain – from The Complete Albums Collection. YouTube. ^ "35 Years Ago: Billy Joel Injures Both Hands in Motorcycle Accident". Ultimate Classic Rock. Retrieved July 14, 2017. ^ "Goodnight Saigon by Billy Joel". Songfacts. songfacts.com. Retrieved November 8, 2010. ^ Thomas, Stephen. "An Innocent Man – Billy Joel : Songs, Reviews, Credits, Awards". AllMusic. Retrieved September 12, 2012. ^ YouTube (uploaded April 6, 2008). ^ Billy Joel's Interview on Howard Stern. 2011. ^ Heatley, Michael; Hopkinson, Frank (November 24, 2014). "The Girl in the Song: The Real Stories Behind 50 Rock Classics". Pavilion Books. Retrieved January 28, 2017 – via Google Books. ^ Sinagra, Laura (January 24, 2006). "At Garden, Billy Joel Is Out to Prove He's in Control". The New York Times. Retrieved April 18, 2014. ^ Hewlett, Anderson. "Pete Hewlett". Archived from the original on March 4, 2016. ^ "Letters to the Editor (November 14, 2007)". Seattle Weekly. Archived from the original on January 17, 2008. Retrieved December 8, 2008. ^ "Billy Joel Blows His Cool, Upsets Piano in Moscow". Los Angeles Times. Associated Press. July 27, 1987. Retrieved June 3, 2013. ^ Pore-Lee-Dunn Productions (February 4, 2007). "Billy Joel". Classicbands.com. Retrieved August 19, 2011. ^ Fabrikant, Geraldine (September 24, 1992). "Billy Joel takes his lawyers to court". The New York Times. Retrieved August 19, 2011. ^ "Profiles – Billy Joel". CityFile.com. Archived from the original on July 24, 2011. Retrieved August 19, 2011. ^ Concerts: Billy Joel & Elton John Archived January 15, 2009, at the Wayback Machine. tampabay.metromix.com. Retrieved on December 8, 2008. ^ a b Evans, Rob (December 2, 2008). "Elton John, Billy Joel plan more 'Face 2 Face' time". LiveDaily. Retrieved on December 8, 2008. ^ "Billy Joel Dismisses Rumors He Yanked Tour With Elton John". rollingstone.com. Retrieved January 28, 2017. ^ Clarke, Eileen (April 20, 2001). "A Matter Of Trust". Entertainment Weekly. Archived from the original on February 20, 2019. Retrieved February 20, 2019. ^ "Joel and Adams in free Rome concert". irishexaminer.com. August 1, 2006. Retrieved January 28, 2017. ^ Cohen, Jonathan (January 30, 2007). ""Billy Joel Returns To Pop With New Single"". Archived from the original on October 12, 2007. Retrieved December 9, 2008. CS1 maint: BOT: original-url status unknown (link). Billboard. Archived from the original on October 12, 2007. ^ Press Release (November 30, 2007). Emerging Singer-Songwriter Cass Dillon Premiers New Billy Joel Song, "Christmas in Fallujah", Exclusively on iTunes Beginning Tuesday, December 4" at the Wayback Machine (archived February 7, 2008). billyjoel.com. Archived from the original on February 7, 2008. ^ The Windsor Star, edition of June 20, 2008. ^ Westerly, Mal (May 24, 2009). "Billy Joel's Former Drummer Files Lawsuit, Liberty DeVitto Says He's Owed $$$". MusicNewsNet.com. Archived from the original on June 15, 2009. Retrieved May 24, 2009. ^ "Billy Joel and Former Drummer, Liberty Devitto Settle Lawsuit". MusicNewsNet.com. April 22, 2010. Archived from the original on April 27, 2010. Retrieved April 25, 2010. ^ a b "Billy Joel Catalog To Be Reissued, Commemorative CDs/DVDs To Be Released" (Press release). Billyjoel.com. October 20, 2010. Retrieved August 19, 2011. ^ Christman, Ed (August 30, 2012). "Exclusive: Billy Joel Signs Global Publishing Deal With Rondor and Universal". Billboard. Retrieved July 17, 2015. ^ Gardner, Elysa (December 3, 2013). "Meet Madison Square Garden's new franchise: Billy Joel". USA Today. ^ "Billy Joel Concert Setlist at Amway Center, Orlando on December 31, 2014 – setlist.fm". setlist.fm. ^ "Billy Joel". Billy Joel. Archived from the original on July 24, 2015. ^ "Billy Joel gives Nassau Coliseum epic sendoff". Newsday. ^ "Movin' Back In: Billy Joel Plays First Concert at Renovated Nassau Veterans Memorial Coliseum in Long Island". billboard.com. Retrieved November 27, 2018. ^ "Fifty years later, Billy Joel addresses Hicksville High grads". Newsday. Retrieved June 28, 2017. ^ "Billy Joel to hold first concert in Camden Yards history". Baltimore Sun. January 10, 2019. ^ Smith, Timothy K. (September 20, 2004). "The Piano Man Builds His Dream Boat Billy Joel has always loved watercraft. But now he has commissioned—and is helping design—a fantastic commuter yacht straight out of the golden age of powerboats". CNN. ^ Billy Joel Timeline Archived March 5, 2010, at the Wayback Machine Archived March 5, 2010, at the Wayback Machine. Dipity.com. Retrieved on November 8, 2010. ^ Karppi, Dagmar Fors (January 21, 2011). "Billy Joel Adds to OB Mix As Chamber Members Chat". Oyster Bay Enterprise Pilot. Archived from the original on March 20, 2012. Retrieved February 4, 2011. ^ Perpetua, Matthew (March 31, 2011). "Billy Joel Scraps Plans to Release Memoir". Rolling Stone. Retrieved April 18, 2014. ^ Nekesa Mumbi Moody (March 31, 2011). "Billy Joel Cancels 'Book of Joel' Memoir". Billboard. Retrieved August 19, 2011. ^ "Billy Joel Cancels 'Book of Joel'" (Press release). Billyjoel.com. March 31, 2011. Archived from the original on September 30, 2011. Retrieved August 19, 2011. ^ "Book Review: Billy Joel Biography Contains Lots of Juice But Many Skeletons Stay Closeted". billboard.com. Retrieved January 28, 2017. ^ Getlen, Larry (January 26, 2014). "How Billy Joel became 'The Piano Man'". New York Post. Archived from the original on November 14, 2016. Retrieved December 10, 2017. ^ "Elizabeth A. Weber". Hollywood.com. November 20, 2014. Archived from the original on August 20, 2017. Retrieved January 28, 2017. ^ a b "Brinkley, Joel Parents of 'Uptown Girl'". Los Angeles Times, December 30, 1985. p. 2. "The 6​1⁄2-pound girl, as yet unnamed, was born in a Manhattan hospital at about 11:45 pm Sunday, said the spokeswoman, Geraldine McInerney." "They were married last March aboard a yacht in New York Harbor." ^ "Joel and his 'uptown girl' have a girl". The Atlanta Journal-Constitution, December 31, 1985. p. A3. "Model Christie Brinkley has given her husband – singer-songwriter Billy Joel – something new to sing about, a 6​1⁄2-pound daughter, a spokesman for the family said Monday." ^ Stout, Gene (December 3, 1986). "Billy Joel Delivers – Few Surprises". seattlepi.com. Retrieved on December 8, 2008. Archived copy at WebCite (July 28, 2010). ^ "Big Billy Joel moments in August: Della Rose Joel was born, Christie Brinkley divorce and more". Newsday. Long Island, New York. August 1, 2017. Archived from the original on November 8, 2015. Retrieved January 28, 2017. ^ "Age-Defying Duos". People. 62 (16). October 18, 2004. Retrieved August 12, 2015. ^ Rush, George (June 17, 2009). "Billy Joel and wife Katie Lee split". Daily News. New York. ^ "Billy Joel Becomes a Father Again — at 66". Celebrity Gossip & News – Yahoo Celebrity Canada. Archived from the original on September 4, 2015. ^ "Billy Joel Marries Alexis Roderick in Surprise Wedding at His Estate". People. July 4, 2015. Retrieved July 4, 2015. ^ "Billy Joel Welcomes Daughter Della Rose". People. Archived from the original on August 24, 2018. Retrieved August 12, 2015. ^ Nelson, Jeff (October 23, 2017). "Billy Joel Welcomes Third Daughter Remy Anne: See the First Photo!". People. Retrieved October 23, 2017. ^ Courtesy of Columbia. "Billy Joel". Mtv.com. Retrieved December 12, 2008. ^ Campbell, Mary (September 5, 1985). "Billy Joel sees self as working homebody". Kentucky New Era. Retrieved April 13, 2011. ^ Associated Press (March 16, 2005). "Billy Joel In Rehab Again". CBS News. Retrieved on December 8, 2008. ^ "Billy Joel leaves US rehab clinic". BBC News. April 13, 2005. Retrieved on December 8, 2008. ^ "Billy Joel's campaign donations" Archived September 20, 2008, at the Wayback Machine Archived September 20, 2008, at the Wayback Machine. NewsMeat.com. Retrieved on December 8, 2008. ^ Rush, George; Hutchinson, Bill (October 17, 2008). "Bruce Springsteen, Billy Joel headline Barack Obama midtown cash bash". New York Daily News. ^ Bedard, Paul; Schwab, Nikki (October 23, 2008). "Billy Joel: Change of Heart and an Obama Endorsement". Washington Whispers. usnews.com. Retrieved August 19, 2011. ^ Polus, Sarah; Polus, Sarah (May 31, 2016). "Did Billy Joel just diss Donald Trump? Probably". The Washington Post. ISSN 0190-8286. Retrieved April 21, 2017. ^ "EXCLUSIVE: Billy Joel is voting for Hillary Clinton". NY Daily News. Retrieved April 21, 2017. ^ Paumgarten, Nick (October 27, 2014). "Thirty-Three-Hit Wonder". newyorker.com. Retrieved May 22, 2015. ^ "Billy Joel". celebatheists.com. Retrieved May 22, 2015. ^ "Photos: Famous atheists and their beliefs". CNN. ^ Tannenbaum, Rob (July 15, 2001). "Dear Superstar: Billy Joel". Blender. Archived from the original on August 22, 2009. Retrieved November 26, 2010. ^ "ATHEIST DAY' 2018". newsweel.com. ^ Anorim, Kevin. "A Billy Joel Tour of Long Island". Newsday. Archived from the original on March 3, 2015. Retrieved September 5, 2014. ^ Tablang, Kristin. "Billy Joel Offers Oceanfront Mansion in Manalapan for $27 Million". Forbes. Retrieved October 21, 2016. ^ Associated Press. (May 14, 2006). "Joel serenades 5,000 Syracuse graduates". USA Today. Retrieved on December 8, 2008. ^ Brozan, Nadine (June 26, 1992). "CHRONICLE". The New York Times. Retrieved April 18, 2014. ^ Cosmic Rationale. "52nd Street Serenade ♪♪". billyjoel52ndstreetserenade.blogspot.co.uk. ^ "Syracuse University to present five honorary degrees at its 152nd Commencement" Archived June 14, 2006, at the Wayback Machine Archived February 8, 2009, at the Wayback Machine. SUNews.syr.edu. April 17, 2006. Retrieved on December 8, 2008. ^ Friedman, Roger (February 26, 2002). "Joel Gets Special Award at Grammy Kickoff Archived February 10, 2009, at the Wayback Machine". foxnews.com. Retrieved on December 8, 2008. ^ "Sound Bites: Billy Club". Daily News. New York, New York, USA. October 8, 1993. p. 19. Retrieved April 17, 2019 – via Newspapers.com. ^ "Billy Joel | Hollywood Walk of Fame". www.walkoffame.com. Retrieved September 11, 2016. ^ "Billy Joel – Hollywood Star Walk – Los Angeles Times". projects.latimes.com. Retrieved September 11, 2016. ^ "Billy Joel in Walk of Fame honour". BBC. September 21, 2004. Retrieved September 11, 2016. ^ "VPA continues Billy Joel Visiting Composer Series with residency by Scottish composer Judith Weir Archived March 9, 2014, at the Wayback Machine Archived March 9, 2014, at the Wayback Machine", Syracuse University, February 14, 2008. Retrieved on December 8, 2008. ^ Billy Joel honored by Steinway, Newsday, December 12, 2011. ^ "Billy Joel, Carlos Santana, Herbie Hancock Receive Kennedy Center Honors". Billboard. Associated Press. December 8, 2013. Archived from the original on December 9, 2013. ^ Tucker, Neely (July 22, 2014). "Billy Joel to receive Gershwin Prize for Popular Song from Library of Congress". Washington Post. Retrieved October 8, 2014. ^ "Joel: 100th MSG show beyond 'wildest expectations'". Newsday. Retrieved July 19, 2018. 52nd Street is the sixth studio album by American singer-songwriter Billy Joel, released in 1978. The follow-up to his breakthrough success album, The Stranger, Joel tried to give the album a fresh sound, hiring various jazz musicians to make it feel differentiated from his previous album efforts. It was the first of four Joel albums to top the Billboard charts, and it earned him two Grammys. Three songs reached the Top 40 in the United States, contributing to the album's success: "My Life" (#3), "Big Shot" (#14), and "Honesty" (# 24). It was similarly well received by critics, earning the 1979 Grammy for Album of the Year. This Grammy was presented to its producer, Phil Ramone. Upon Ramone's death, 52nd Street's Album of the Year Grammy was passed on to Joel. Additionally, the album is notable for being among the first albums commercially released on the compact disc format, reaching store shelves on October 1, 1982 in Japan (it was one of fifty CDs released that day, including three other Joel albums, but bore the first catalogue number in the sequence, 35DP-1, and so is frequently cited as the first to be released). In keeping with this history, it was also the first release when Sony returned to manufacturing vinyl records in 2018.The title is a reference to 52nd Street, one of New York City's jazz centers in the middle of the century. Joel's label was headquartered on 52nd Street (in the CBS Building) at the time of the album's release. The studio where recording took place was also on 52nd Street, one block away from the CBS Building. The Billy Joel Band is the band that backs singer-songwriter and pianist Billy Joel on both studio and live recordings. 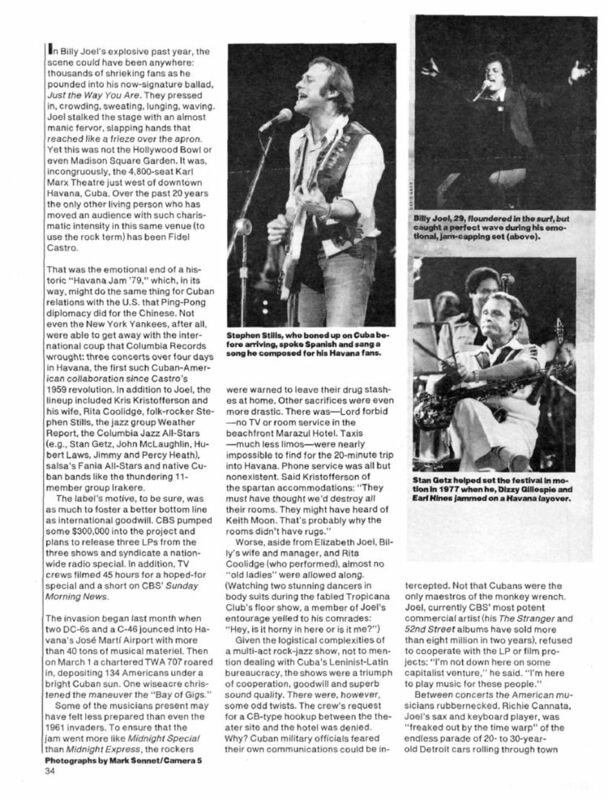 The band stabilized around 1975 but underwent several lineup changes in the late 1980s and early 1990s. Joel's touring band as a whole did not begin playing on his records until he recorded the album Turnstiles in 1976. This line-up included Richie Cannata on saxophones and organ, Liberty DeVitto on drums, Russell Javors on guitar, and Doug Stegmeyer on bass.The band, which now no longer includes any of its original members, is often not recognized as a formal entity, and is instead referred to simply as Billy Joel's band. "Captain Jack" is a song by Billy Joel featured on his 1973 album Piano Man with a live version on his 1981 album Songs in the Attic. It is considered by some to be the most important and pivotal of his early compositions because his performance of the song at an April 15, 1972, live radio concert at Sigma Studios on WMMR in Philadelphia, and the subsequent airplay this live version received on the station, brought him to the attention of major record labels, including Columbia, with whom he would sign a recording contract in 1973. Riding on the success of the previous two tours Elton John and Billy Joel once again hit the stadiums. The tour had previously only toured in the United States and Canada, but this time they visited Australia, New Zealand, Japan and Europe, avoiding any North American cities.On 6 June, Joel pulled out of a concert at Wembley Stadium in London, England due to illness. John performed the show without him, but he performed several of Joel's songs. The same happened in Zurich, Switzerland at Letzigrund Stadium on 30 June; this was the last night of the 1998 tour.Joel stated in 2012 that he would no longer tour with Elton because it restrains his setlists. In early February 2010 Elton John and Billy Joel set out on another leg of their concert series Face to Face. Most of these shows had been rescheduled from the year before when John had contracted E.Coli forcing the pair to cancel the concerts planned for the fall of 2009, Joel was also unwell at the time of the gigs the previous year.Despite several outlets reporting four summer concerts in Chicago, Pittsburgh and Boston, Joel denied these rumours in the trade press that he cancelled a summer 2010 leg of the tour, claiming that those concerts were never booked in the first place and saying that he intended to take the year off from performing and music. Joel told Rolling Stone magazine: "We'll probably pick it up again. It's always fun playing with him." Joel stated in 2012 that he would no longer tour with Elton because it restrains his setlists. "Hey Girl" is a song written and composed by Gerry Goffin and Carole King. It first became a popular Top ten hit on the Billboard Hot 100 in August, 1963 when recorded by Freddie Scott. Donny Osmond took the song back to the Billboard top ten chart with his remake in 1971. There have also been many other cover versions of this song, including a cover by Billy Joel in 1997. "Honesty" is a song by American singer and songwriter Billy Joel. Columbia Records released the song as the third single from his sixth studio album 52nd Street (1978) in 1979. "Honesty" was solely written by Joel, while production was handled by Phil Ramone. The song was not included on any of Joel's US-released compilation packages; however, it appears on the Dutch and Japanese editions of Greatest Hits Volume 2, replacing "Don't Ask Me Why" (1980). "Honesty" is a piano ballad that talks about the inherent lack of shame. The song received mostly positive reviews from music critics, who generally praised its lyrics and piano instrumentation. It also received comparisons to other songs by Joel. "Honesty" peaked at number twenty-four on the US Billboard Hot 100 chart, becoming the album's third consecutive top forty hit. It went to Number 1 in France and has also been certified gold by Recording Industry Association of Japan for ringtone download sales of over 100,000 units. Joel performed the song live several times with Elton John and later with Bryan Adams. "Honesty" has been covered and sampled by various artists, including by American R&B recording artist, Beyoncé. "Just the Way You Are" is a song by Billy Joel from his fifth studio album The Stranger (1977). It was released in September 1977 as the album's lead single. It became both Joel's first US Top 10 and UK Top 20 single (reaching #3 and #19 respectively), as well as Joel's first gold single in the US. The song also topped the Billboard Easy Listening Chart for the entire month of January 1978. "Just the Way You Are" garnered two Grammy Awards for Record of the Year and Song of the Year in 1979. "Make You Feel My Love" is a song written by Bob Dylan from his album Time Out of Mind (1997). It was first released commercially by Billy Joel, under the title "To Make You Feel My Love", before Dylan's version appeared later that same year. It has since been covered by numerous performers and has proved to be a commercial success for singers such as Adele, Garth Brooks, Shane Filan, Bryan Ferry, Kelly Clarkson and Ane Brun. Two covers of the song (one by Garth Brooks and one by Trisha Yearwood) were featured on the soundtrack of the 1998 film Hope Floats. Dylan eventually released the song as a single. "Movin' Out (Anthony's Song)" is a song written and recorded by Billy Joel. The track details the singer's disgust with the upwardly mobile bourgeois aspirations of working- and lower-middle-class New Yorkers who take pride in working long hours to afford the outward signs of having "made it". Characters have stereotypically ethnic names (Anthony, Mama Leone, Sergeant O'Leary, Mr. Cacciatore) and blue-collar jobs. Joel considers their rejection of their working-class roots (trading a Chevy for a Cadillac and buying a house in Hackensack, New Jersey) ultimately futile. Near the end of the recording is the sound of a car starting up and driving away; the bass player Doug Stegmeyer's 1960s Corvette was used. According to Joel, Anthony is not a real person, but rather "every Irish, Polish, and Italian kid trying to make a living in the U.S."
"Movin' Out" originally appeared on Joel's 1977 album The Stranger. A live performance of it can be heard on 2000 Years: The Millennium Concert. Movin' Out is a 2002 jukebox musical featuring the songs of Billy Joel. Conceived by Twyla Tharp, the musical tells the story of a generation of American youth growing up on Long Island during the 1960s and their experiences with the Vietnam War. The principal characters are drawn from those who appeared in various Joel tunes: high school sweethearts Brenda and Eddie ("Scenes from an Italian Restaurant"), James ("James"), Judy ("Why Judy Why"), and Tony (Anthony in "Movin' Out"). The show is unusual in that, unlike the traditional musical, it essentially is a series of dances linked by a thin plot, and none of the dancers sing. All the vocals are performed by a pianist and band suspended on a platform above the stage while the dancers act out the songs' lyrics, making the show, in essence, a rock ballet. "Piano Man" is a song written and performed by American singer-songwriter Billy Joel. His first single in North America, it was included on Joel's 1973 album of the same name and later released as a single on November 2, 1973. The song is sung from Joel's point-of-view working as a piano player at a bar, reminiscing on his experiences working there and the people that he encountered. "Piano Man" is based on Joel's real-life experiences working as a lounge musician in Los Angeles from 1972-73, in an effort to escape his contracted New York-based record company at the time, Family Productions, following the poor commercial performance of the album Cold Spring Harbor. Joel describes various characters, including a bartender named John and a "real-estate novelist" named Paul, all based on real-life individuals. Joel's first major hit and his signature song, "Piano Man" peaked at #25 on the Billboard Hot 100 chart in April 1974. Following Joel's breakthrough as a popular musician with the release of The Stranger, it became one of his most well-known songs. It is now a highlight of Joel's live shows, where he usually allows the audience to sing the chorus. In 2016, the Library of Congress selected "Piano Man" for preservation in the National Recording Registry for its "cultural, historic, or artistic significance." "Shameless" is a song written by American singer Billy Joel and recorded on his 1989 album Storm Front. His version peaked at #40 on the Hot Adult Contemporary Tracks charts. Two years later, the song was covered by country music artist Garth Brooks on his third studio album, 1991's Ropin' the Wind. Brooks' rendering of the song was his seventh Number One hit on the Billboard country charts in late 1991. It also reached #71 on the UK Singles Chart. In 1993, on stage in Boston, Billy Joel introduced the song by saying, "I want[ed] to write a song, like a Jimi Hendrix song, you know. Back in the sixties, he was one of my idols, Jimi Hendrix." Billy Joel also mentioned the Hendrix inspiration at a talk in Nuremberg, in 1995. "The Ballad of Billy the Kid" is a song by American singer-songwriter Billy Joel from the album Piano Man. It was also issued as a single in the UK backed with "If I Only Had The Words (To Tell You)." Turnstiles is the fourth studio album by American singer-songwriter Billy Joel, released on May 19, 1976. "Uptown Girl" is a song written and performed by American musician Billy Joel. The lyrics describe a working-class "downtown man" attempting to woo a wealthy "uptown girl." It was released on September 29, 1983, on his ninth studio album An Innocent Man (1983). The 12" EP featured the tracks "My Life", "Just the Way You Are" and "It's Still Rock and Roll to Me" (catalogue number TA3775), whereas some 7" single versions featured "Careless Talk" as a B-side (TBC). Vienna is a song from Billy Joel's 1977 album The Stranger, released as the B-side to his "Just the Way You Are" single. In a July 2008 New York Times article, Joel cited this as one of his two favorite songs, along with "Summer, Highland Falls".It was played in a 1981 episode of Taxi called "Vienna Waits". Marilu Henner's character Elaine Nardo refers to the song while on vacation in Europe with Alex Reiger, played by Judd Hirsch. Due to licensing restrictions, the song has been omitted from the episode on DVD, though is intact on the Hulu versions of the episode. "Vienna" can also be found on the soundtrack of 13 Going on 30. "We Didn't Start the Fire" is a song by American musician Billy Joel. Its lyrics include brief, rapid-fire allusions to more than 100 headline events between 1949, the year of Joel's birth, and 1989, when the song was released on his album Storm Front. The song was nominated for the Grammy Award for Record of the Year. The song was also a No. 1 hit in the United States in late 1989.